There’s an endless pool of brunch choices in Shanghai—and many of them are amazing! But we wanted to make you’re brunch selection easier to choose from, so we condensed your options to a list of 7 popular brunch places with food items from all over the world. Located in the Former French Concession, this chic restaurant is the place to be on the weekends. Make sure to try the delectable American classics like grilled cheese and tomato soup. Listen up egg lovers! 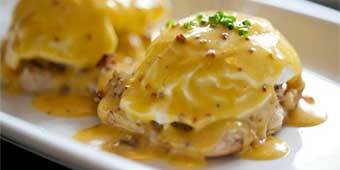 Madison has some of the tastiest brunch egg dishes! The Poached Eggs melt in your mouth; and the Scottish Duck Eggs, albeit not an American dish, are definitely worth trying. This restaurant has many Chinese options. But if you want to order from the brunch menu, you only have Western options. This is a great brunch spot from groups who want the best of both worlds—food from the East and West. But above all, The Grumpy Pig is a haven for those who love pork! The Pork Steamed Buns with savoury pork belly is a definite must try. As for brunch items, the Grumpy BIG Platter and Ultimate Bacon Egg & Cheeseburger are delicious pork-friendly choices. This cosy restaurant in located on the less busy side of Yongkang Lu. HLK serves Canadian breakfast all day. The HLK Big Breakfast is a classic choice; it comes with sausage, eggs, beans, ham, bacon and pancakes. They also have tasty non-breakfast items like Shepard’s Pie and Poutine; make sure to try a glass of wine from their wide selection. Located of the corner of Yonkang Lu, this restaurant offers the tastiest and most authentic tacos in town. The brunch set includes ceviche, chorizo pork gorditas (tortilla-like sandwiches with meat), a breakfast burrito, eggs, and cake. Plus you can choose from a michelada cocktail or soft drink. If you feel like keeping the party going, El Luchador also offers happy hour from 14:00 to 19:00, everyday. This Cantonese restaurant has some of the most affordable and scrumptious dim sum in Shanghai. The restaurant is located inside Zhongshan Park in the Royal Garden Hotel. Be prepared for a long wait though, it’s always busy during the early brunch times. Make sure to try the out-of-this world pork and shrimp Shao Mai. For those adventurous food tasters, try the pigeon dishes. Brunch Hours: Mon-Fri, 9.30-16.30; Sat-Sun, 9.00-16.30; Specials: Mon-Fri dim sum is 12% off before 14:00 and 30% off after 14:00. The Parisian bistro is located in Bund area and it’s the place to go when you want to unwind with a few friends. The Brunch set menu includes three course meals. Some of which are French classics, such as the pate, onion soup, veal Milanese (more of an Italian classic, but still mouth-watering), and crème brulée, plus coffee and sweets. This restaurant is a favourite among the British expats. The Full English brunch item is a must-have for Brits craving a taste of home. The Full English choice includes eggs, bacon, sausage, tomatoes, mushrooms, beans, chips, toast and homemade black pudding. Mr. Harry also serves brunch dishes that accommodate special diets, such as the No Carb Breakfast and Vegetarian Breakfast.